Meet Julie Bigbow Mcgee, whose cheery grin and child-in-a-flower-shop style always catch our eye on Facebook: We also noticed Julie last year on Take Me Out (if you've not seen it, it's the ultimate guilty pleasure TV dating show). We had to know more! Julie, where does the name Bigbow come from? Bigbow isn't my real name, but I set it as my Facebook name after I went on Take Me Out. It was my nickname backstage as I always wore one of my homemade bows or headbands! All the girls sent me pictures and friend requests as it was easy to remember. On my date I wore my Tatty Devine Cockatiel Ring. 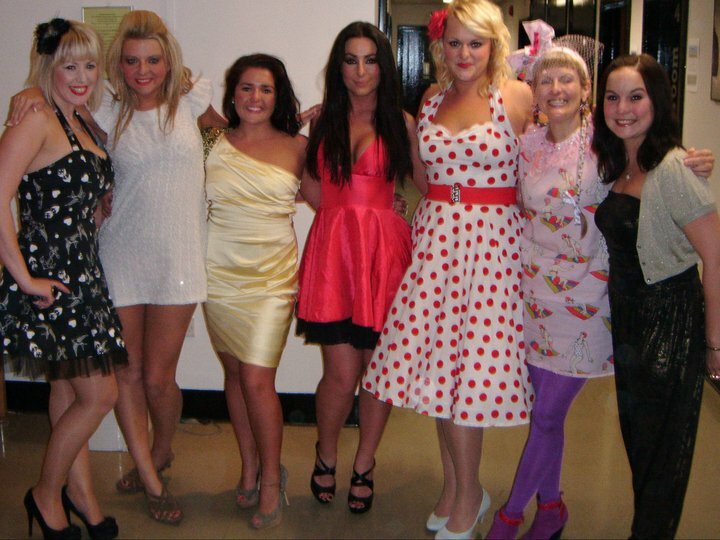 Here's Julie with some of the Take Me Out girls (loving the purple tights): How did you discover Tatty Devine? 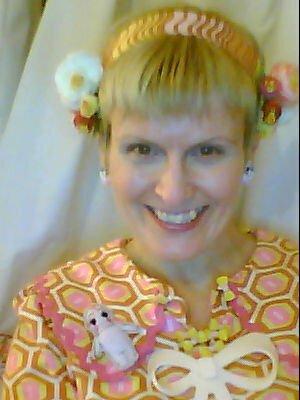 I found Tatty Devine a few years ago when a little shop opened in Norwich called Soho Hip. My first piece was the Horse & Carriage Necklace. I still love it. Ever since then, if anyone wants present ideas for me, Tatty Devine is always a winner!! My favourite piece is my big white Cockatiel Necklace. How would you describe your style? 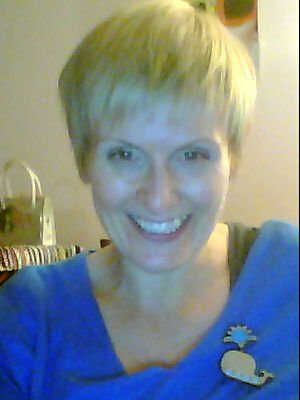 I wear Tatty Devine and N2 les Nereides all the time so I always have one or the other on - or both. I bought the Tatty Devine sunglasses from John Lewis for summer. 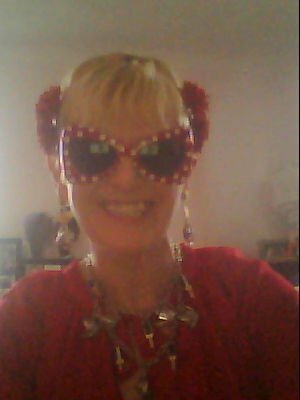 We think Julie likes her sunglasses: Do you make your own accessories, too? Yes, I like making brooches and hair accessories. 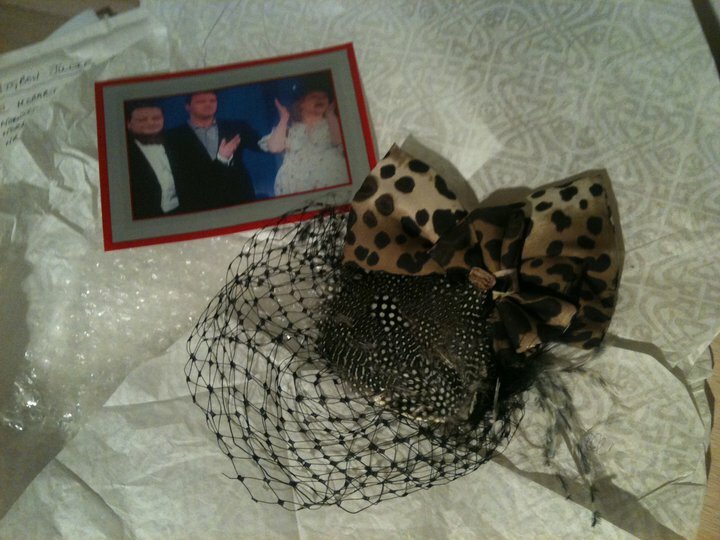 I just sent Natalie Booth from Take Me Out this leopard and feather fascinator that I made for her: What else are you into? I love running but haven't been for ages as I fell down some stairs and tore a ligament in my foot! Ouch! I also make cards for family and friends, and me and my daughter also ALWAYS make each other our birthday cards. What's your favourite outfit? It varies all the time but I have to say that yellow is my absolute FAVOURITE colour so anything yellow. 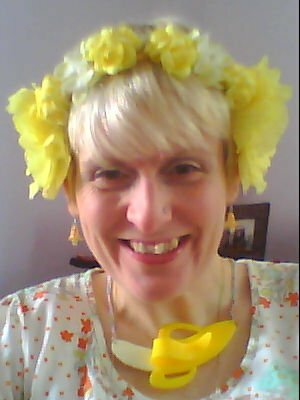 And at the moment I always wear my Tatty Devine Banana Necklace with anything yellow! You seem like a very smily person - what's your secret? I always look on the bright side of life - and I always see a funny story to tell even in a miserable situation. I love to laugh and to have people laugh with me! People make me smile. I am generally a very happy girl! What do you wish Tatty Devine would make next? I think Tatty Devine should make some quirky bags. I like the ones in Octopus. I have watering can, teapot and car bags! Thank you Julie! We've not got any bags to send you, but we'll be sending you some jewellery to say thank you for being our Customer of the Month. We'll try to pick something yellow! If you'd like to be our Customer of the Month, here's how to get noticed: tag Tatty Devine any time you post a photo of you wearing your jewellery on Facebook. Or mention @tattydevine when you post photos of you wearing your jewellery on Twitter. We're inspired by Julie to raid the scarf drawer this weekend and tie some big, big bows in our hair.